You are here: Home / Criminal Law / Court / What happens to a witness (or victim) if they fail to appear for court? What will happen to a witness (or alleged victim) if the witness fails to show up for court? It is most commonly a wife, or girlfriend, of a defendant in a domestic violence case that asks this question. I suspect they are asking this because they hope that their absence from the court will result in a dismissal of the case. Telling a Witness Not To Come To Court is a Felony. When asked, I am reluctant to answer this question. I do not want a witness to think I’m telling them not to come to court. I also do not want my client telling a witness not to come to court. It is a felony in Idaho for anyone to influence a witness not to testify fully or truthfully. The State could charge someone who does this with felony witness tampering. Also known as Witness Intimidation in Idaho. The State charges this crime frequently. Lack of a Witness Sometimes Means Case Dismissed. It is true that failure of a witness to appear in court will sometimes result in a dismissal of the defendant’s case. The reason for this is because a defendant has a right to confront the witnesses who will testify against him. If the State has no other evidence against the accused, the State may dismiss the case. Dismissals are not automatic. The State could request a continuance of the trial if a witness fails to appear in court. However, the Court will only grant the request if the State served the witness with a subpoena. Consequences for a Witness Who Fails to Appear. On the other hand, if a witness fails to appear in court there could be implications for the witness. There will only be consequences for the witness if the State has properly subpoenaed the witness. 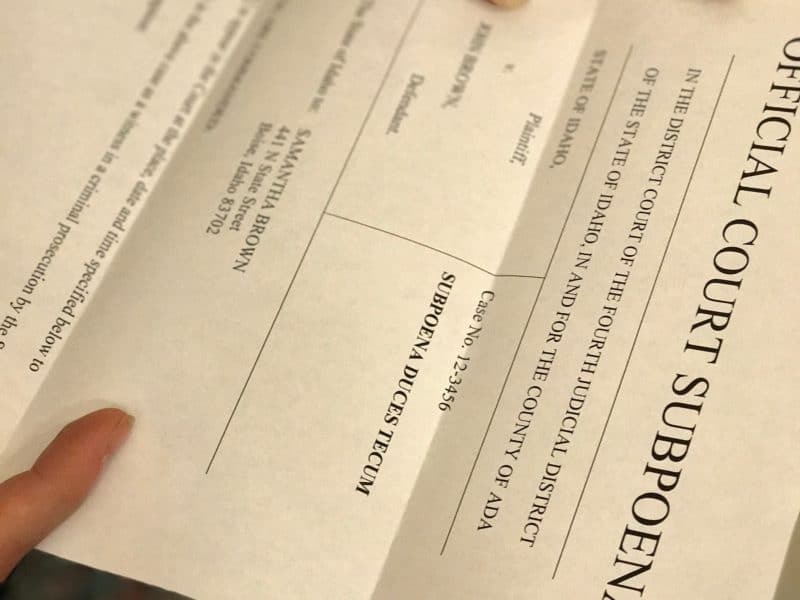 To properly subpoena a witness, the prosecuting attorney must have the subpoena personally served on the witness. Once the State has done this, the witness is legally obligated to come to court. If the witness fails to appear in court, the Court can issue a warrant for the arrest of the witness. The witness could be taken into custody and remain in custody until the day of the trial. A Witness’s Presence is Sometimes Helpful. If the State did not serve the witness with a subpoena, the witness would not be legally obligated to come to court. If a witness has been asked to go to court, it could be for the witness’s benefit. Another example of when it may benefit a reluctant witness to show up to court is when the State wishes to communicate a settlement to the witness. If a prosecuting attorney learns that a witness desires a particular type of resolution, the prosecuting attorney sometimes will resolve the case in that way. And sometimes if the witness lets the prosecutor know they are unwilling to testify, the prosecuting attorney may make a better offer to the defendant. In summary, if a witness fails to appear in court, it could theoretically help the case of the accused, but the consequences may offset any benefit obtained. Further, a witness’s presence in court may help the case of the accused where the witness’s absence would have hurt it. And in some instances, the lack of a witness will result in a dismissal of the case. Calling a criminal defense attorney and speaking to him about your circumstances is the best advice. Previous Post: « Should I refuse to blow when arrested for DUI?